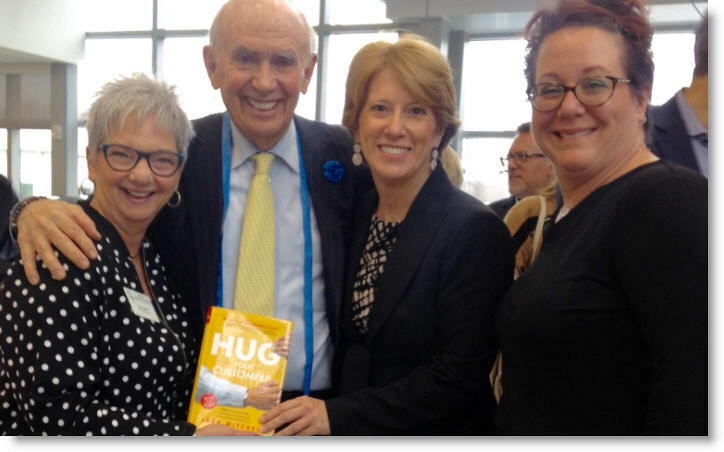 ‘Hugging’ Your Chamber Of Commerce! In the spirit of collaboration, the Brewster Chamber of Commerce partnered with the bordering Ridgefield, CT, Chamber of Commerce to bring about a very special presentation by Jack Mitchell, author and owner of a multi-generational specialty clothing store named Mitchells Store, who spoke about creating the unique customer experience to bring about success. Dozens of chamber members and business owners assembled at BMW of Ridgefield on April 20th for breakfast to network and learn how to excel in exceptional customer care. Mr. Mitchell is the author of two books: “Hug Your Customer,” published in 2003, and ” Hug Your People,” published in 2008. He emphasizes the importance of showering customers with attention and elevating relationships to the forefront of service. He said, “Businesses need to have the mindset and passion to live, learn and grow” by understanding what makes customers feel valued. Dual chamber member, Bonnie Leavy, Director of Community Relations of Putnam Ridge, attended the meeting with hopes to connect with other members and to exemplify the care and compassion that goes into their business model as a rehabilitation center. She said, “To have the opportunity to speak to Mr. Mitchell about his business success will help shape and fuel how we partner with our patients and key referral sources now and in the future.” Many other chamber members had questions regarding customer service, such as customer retention and loyalty programs. Mr. Mitchell again emphasized keeping things simple by inspiring others to create a culture that extends beyond the workplace and into our everyday lives. Pictured here is Rose Aglieco, Executive Director of the Brewster Chamber of Commerce, Speaker Jack Mitchell, Bonnie Leavy of Putnam Ridge, and Jennifer Zinzi, Executive Director of the Ridgefield Chamber of Commerce.